The Takamine KC70 Kenny Chesney Signature orchestra electro acoustic guitar captures the island spirit thanks to the tones given off by the Cedar top and Sapele back and sides. The Kenny Chesney Signature also comes complete with top of the line electronics and a premium hardshell case. 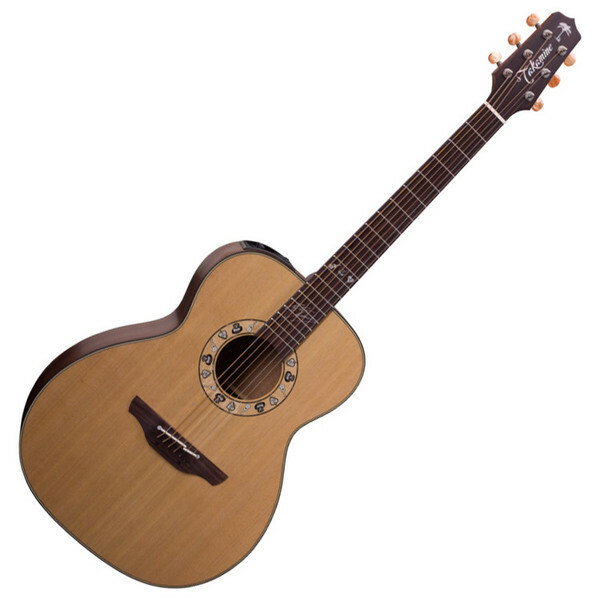 Takamine's Kenny Chesney Signature electro-acoustic guitar combines its solid Cedar top with solid Sapele back and sides to provide that distinctive, warm Kenny Chesney sound. The Kenny Chesney electro-acoustic guitar also features a Mahogany neck with Rosewood fingerboard, combined with Takamine's split bone saddle bridge, this guitar is capable of producing a fantastic acoustic range and flawless intonation. The KC70 has pewter tuners for greater tuning stability a natural satin top finish and satin sides and back, as well as featuring the CT4B II pre amp system with 3 band EQ, volume control and a built in tuner.